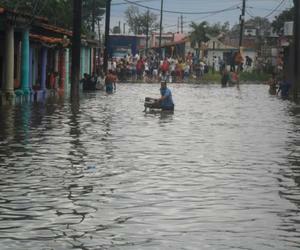 Several neighborhoods were flooded in the city of Pinar del Rio after heavy rains associated with tropical storm Collin dropped some 141 millimeters in 24 hours, ACN reported. Specialists reported that the precipitations amounted for 220 millimeters, causing great accumulations of water in low areas. One major problem in the city as of this moment is, paradoxically, the water supply to its inhabitants, since the pipe system is down. Before the beginning of the rains, work was underway to repair the system, but the area is flooded, preventing access to the main line. The provisional government allocated several trucks to take fresh water to the population, till the system is up and running in the next days, when the weather allows it. According to the head of the Agriculture Ministry in Pinar del Rio, Victor Fidel Hernández, a large part of the more than 38 thousand ha of plantations are under water, but the tobacco leaves stored at the curing barns are safe.